Borderline brings together four artists working in a space Fabienne Lasserre refers to as the “excluded middle.” Bonnie Collura, Alex Ebstein, Fabienne Laserre, and Adia Millett create works that ask us to question the language of abstraction. Classifying them as painters or sculptors is reductive. Their materials and formal choices are purposeful, born of art history and mindful of the histories of feminism and craft. 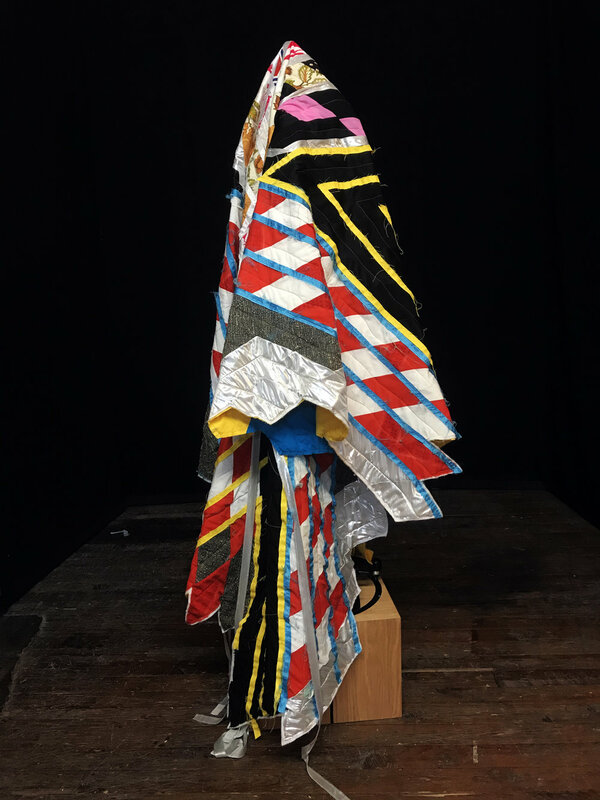 They employ sewn, layered, quilted, and wrapped elements in their anthropomorphic works, allowing the results to exist in-between classically defined categories. More specifically, their confident use of materials such as fabric, yoga mats, vinyl, and steel questions hierarchies assumed by art history, pop culture, and politics, while addressing the contemporary spotlight on gender and power. Bonnie Collura received her BFA from Virginia Commonwealth University in 1994 and her MFA from Yale University in 1996. She is the recipient of a 1997 Emerging Artist Award from the Aldrich Museum of Contemporary Art, a 2003 Rolex Protégé nomination, a 2005 John Simon Guggenheim Memorial Foundation Fellowship, a 2010 United States Artists Fellowship nomination, a 2010 MacDowell Colony Fellowship, and six research grants from Penn State University. Collura’s works have been exhibited in national and international galleries and museums spanning the United States, France, Italy, Belgium, Germany, and India. Her work has been reviewed in The New York Times, The New Yorker, Art Forum, Art in America, Art News, Flash Art, BOMB magazine, Beautiful Decay, Teme Celeste, Sculpture Magazine, Time Out New York, and several other print and online publications. Collura currently lives in Bellefonte, PA.
Alex Ebstein is an artist, curator, and critic based in Baltimore, MD. She received her BA in Studio Art from Goucher College in 2007 and a MFA from Towson University in 2015. Her work has been exhibited in solo shows at Cuevas Tilleard in New York, NY; Frutta Gallery in Rome, Italy; SophiaJacob in Baltimore, MD; and Kent Place Gallery in Summit, NJ. Recent group exhibitions include The Shared Patio at Greenpoint Terminal Gallery in Brooklyn, NY; After Image at Loyal Gallery in Stockholm, Sweden; Material Studies at Vox Populi in Philadelphia, PA; Jade at Central Park in Los Angeles, CA; and Implicit Horizon at Mixed Greens in NYC. Fabienne Lasserre is based in Brooklyn, NY. She received her MFA from Columbia University in 2004. Her work has been exhibited at The Contemporary Arts Museum, Houston, TX; The Museum of Contemporary Art, Montreal, Canada; and the Museum of Modern Art, Medellin, Columbia. Her work was included in The Quebec Triennial at the Contemporary Art Museum, Montreal and in exhibitions at Parisian Laundry, Montreal, Canada; David Petersen Gallery, Minneapolis, MN; Regina Rex, Brooklyn, NY; Sikkema Jenkins & Co., NYC; and Gallery Diet, Miami, FL. Residencies include a Workplace Residency at Dieu Donné in NYC and the Sharpe-Walentas Studio Program in Brooklyn. Lasserre received a 2013 Project Grant for Visual Artists from the Canada Council for the Arts. Adia Millett currently lives and works in Oakland, CA. She received her MFA from CalArts, followed by the prestigious Whitney Museum Independent Study Program and the Studio Museum in Harlem residency program. Millett has been a standout in seminal exhibitions including Greater New York at PS1 in Long Island City, NY, and Freestyle at the Studio Museum in Harlem. She has shown at venues including the Barbican Gallery in London; The California African American Museum, LA; The Craft and Folk Museum, LA; The New Museum of Contemporary Art, NYC; The Museum of Contemporary Art, Atlanta; The Santa Monica Museum of Art; The Contemporary Art Center in New Orleans; and The Contemporary Art Center in Virginia. She is a NYFA Fellowship recipient and was a resident at the Headlands in Marin, CA and Three Walls in Chicago. The Remix is a project-based curatorial team established to exhibit the work of underrepresented artists. Founded in 2017 by three former colleagues from Mixed Greens gallery—Heather Bhandari, Courtney Colman, and Steven Sergiovanni—it strives to create and promote new platforms that foster transparency, community, generosity, and the sharing of resources among artists and arts workers alike. 850 3rd Ave, Suite 411, Brooklyn, 11232.